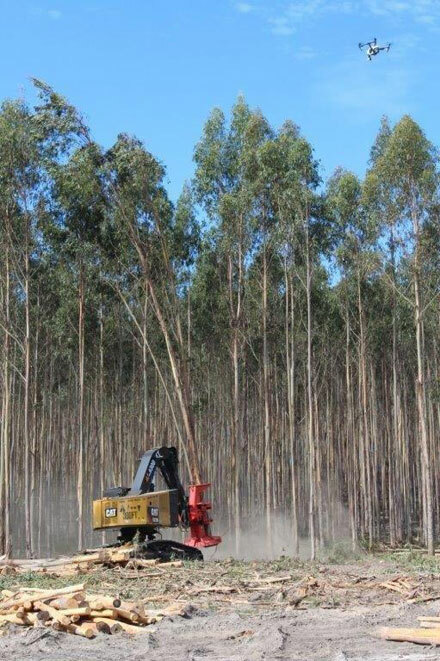 Researchers on a project funded by FWPA and managed by the University of the Sunshine Coast’s Forest Industry Research Centre (FIRC) say the new tools could save the forestry industry millions of dollars. Given that green wood contains so much moisture, substantial transport cost savings are achievable through infield log drying. “With more than 25 million tonnes of predominantly green logs and chips transported in Australia per year at a cost of over $350 million, potential annual savings of millions of dollars in annual land transport costs are possible, even for relatively small reductions (less than 10%) in moisture content,” Professor Mark Brown, director of FIRC, said. A literature review showed that use of post-harvest forest biomass for domestic energy use and for export is common overseas but is a largely untapped resource in Australia, and will continue to be so unless delivered costs can be reduced. “High harvest and transport costs are a critical barrier to increased forest biomass use, and integration of forest biomass harvesting with conventional forest harvesting has been shown to be an efficient option,” Professor Brown said. Professor Brown explained that infield drying of chip logs and higher-value logs can lead to deterioration in quality and additional processing machinery wear and tear however, little was known about the magnitude of these issues and at what moisture content they become significant. The FIRC project included infield drying trials of biomass, chip-logs and higher-value wood products, as well as chipper time and motion studies, with variables such as location, season, species and pile size. Field trial results were then used to create drying models and software tools and this was followed by operational trials conducted with industry collaborators. The predictive tools developed through this research will enable forest growers to make informed decisions regarding infield storage of logs and biomass so they can reduce moisture content to the point where returns from lower transport costs outweigh any losses from reduced quality, increased storage costs and increased machinery wear and tear.